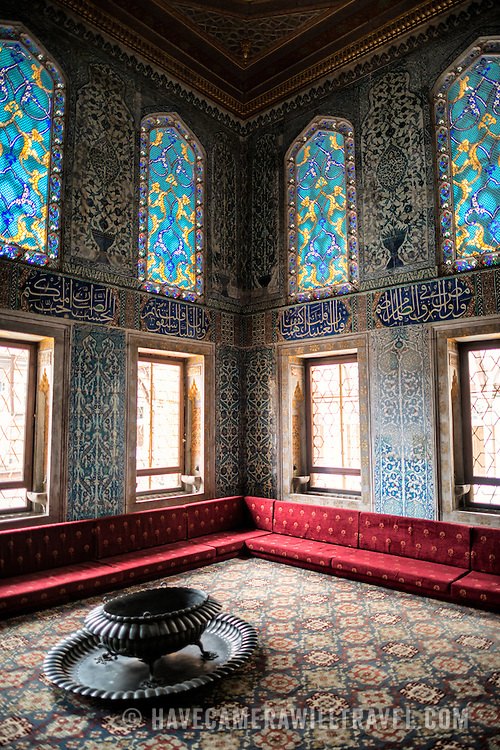 The Twin Kiosk at Topkapi Palace consists of two privy chambers built in the 17th century, at different times. It is decorated with Iznik tiles and draws on a number of classical Ottoman styles used throughout the palace. From the 18th century, the Twin Kiosk was used as the privy chamber of the Crown Prince. The Imperial Harem was the inner sanctum of the Topkapi Palace where the Sultan and his family lived. Standing on a peninsular overlooking the Bosphorus Strait and Golden Horn, Topkapi Palace was the primary residence of the Ottoman sultans for approximately 400 years (1465–1856) of their 624-year reign.